Concrete is expected to be poured overnight for the foundation of the Herndon Metro Station pedestrian bridge. The work is planned to be done between 10 p.m. Monday and 4 a.m. Tuesday, according to the Dulles Corridor Metrorail Project. 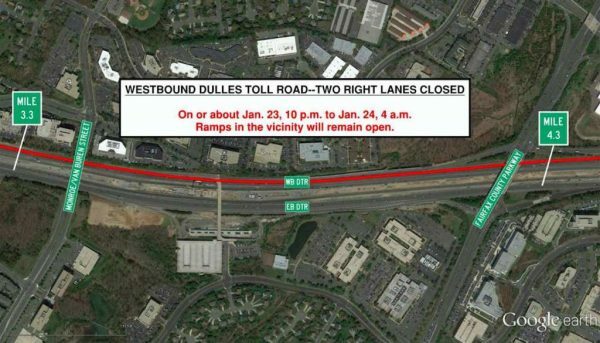 The two right lanes of the westbound Dulles Toll Road will be closed between the Fairfax County Parkway overpass and the Monroe/Van Buren Street overpass for the duration of the work. The pedestrian bridge, when complete, will provide access to the Silver Line’s Herndon Station, near the Herndon-Monroe Park and Ride. Ground was broken in late November for a new, second parking garage at the Herndon-Monroe Park and Ride. A large amount of other work along the Dulles Toll Road related to the Metro’s expansion continues as well. The Dulles Corridor Metrorail Project recently reported that work on the Silver Line expansion is progressing steadily.